The man known to the wrestling fraternity as the mighty midget has died peacefully at his home in Aukland, New Zealand at the grand old age of 84 from natural causes. Miniscule BERNARD MURRAY , was considered by his peers to be one of the greatest professional wrestlers that ever entered a wrestling ring, with a comedic routine that inspired the late great LES KELLETT, he was considerate, and happily shared the limelight with his many opponents of the day. However, outside the ring and away from the entertainment razzamatazz of the Pro world, at the legendary Wigan gym called 'THE SNAKEPIT' ,where he frequented regularly, this little firecracker transformed into one of the most lethal shoot wrestlers in the world. 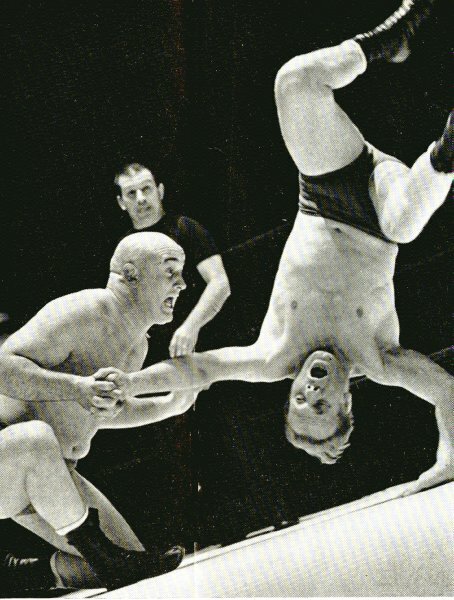 A true doyen of the mat, where wrestlers had to fight to earn their laurels,he was worthy of the title 'pistol' man, which in wrestling phraseology means a master of the deadly no holds barred submission style of wrestling, respected the world over. 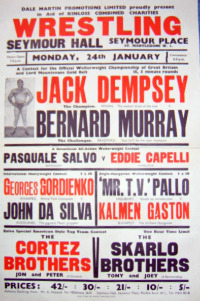 Bernard ranked amongst the best such as BILLY JOYCE , JACK DEMPSEY, ERNIE AND BILLY RILEY, CADMAN BROTHERS, and other great exponents of that era. Traditionally, the pecking order of hard men in the Business has always been KARL GOTCH, GEORGES GORDIENKO, and LOU THESZ , all of whom learnt their craft at the Snakepit when staying in Britain and using the skills of Murray etc., as a role model. The indomitable GEORGES GORDIENKO once said of Murray, 'He is the toughest man I know and I just cannot take a submission on him'. Praise indeed from the man that the whole world feared, and could take a submission every three inches of the body. KARL GOTCH considered to be the true God of wrestling, also used to say that Bernard was his inspiration to become the best in the world which he certainly did with a vengeance.Our own RAY FURY , himself an inspired shooter reports that 'Bernard Murray was the only man that I truly feared in the 'pit'. He was unstoppable and the world is a sorry place for his passing'. Ironically, Bernard who was born Bernard Moran always signed his autographs with his real name, saying that he didn't want to give up his real identity. A true mark of greatness ! Following his retirement from Professional wrestling, he worked for years as a celebrated referee on the Northern circuits,and was partially responsible for the teaching of his great student : 'Cry baby' JIM BREAKS himself a master grafter. 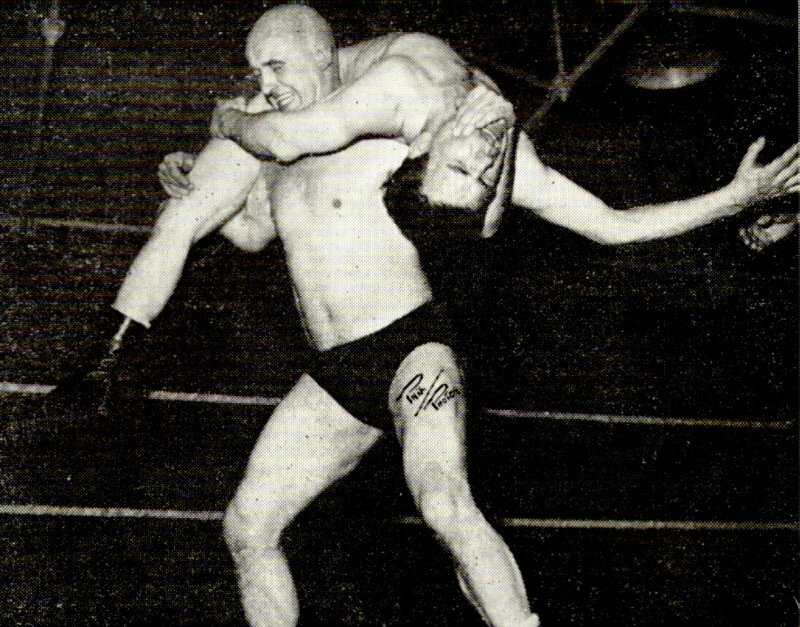 Bernard continued to teach submission wrestling into his eighties and having emigrated to New Zealand late in life, was a prominent figure in the gyms until just before his death. We shall enter his name into the 'dressing room in the sky 'with great pride, as we are sure that he will be somewhere up there teaching everyone how to wrestle properly.